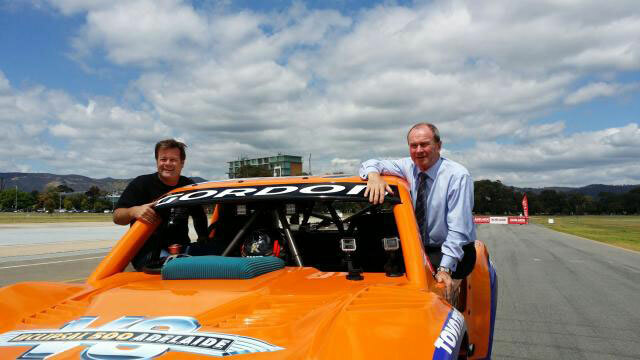 Australian off road racing is set to reap the rewards of unprecedented exposure after today’s announcement by the South Australian Government and Clipsal 500 Adelaide organisers that Robby Gordon’s Stadium Super Truck Series will be part of their 2015 Clipsal 500 on-track schedule. 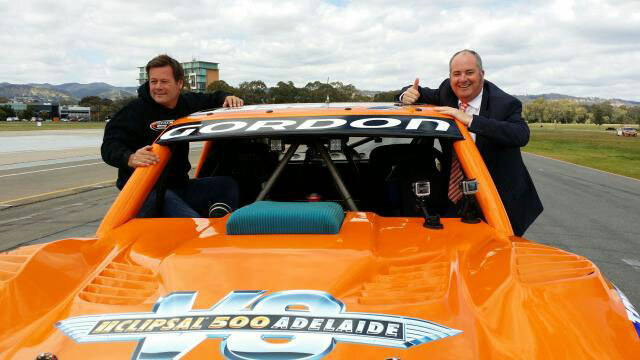 South Australian Minister for Tourism, Leon Bignell, today announced the Australian first with American racing pioneer and NASCAR legend Robby Gordon, confirming he will bring his popular new Stadium Super Truck Series to next year’s Clipsal 500 Adelaide. Touted as the world’s newest and most exciting form of racing, the 2015 Clipsal 500 Adelaide will be the first time these 600 horsepower V8 truck will compete for points outside North American. 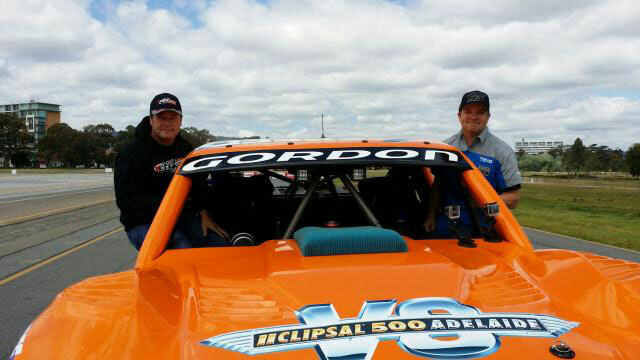 Owner and headline driver, Robby Gordon jetted into Adelaide for the announcement, giving a glimpse of what’s in store for next year’s Clipsal 500 fans, putting on an impressive demonstration of the capabilities of the high-horsepower trucks. 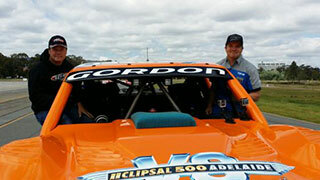 On board in the navigator’s seat to experience Robby Gordon’s driving prowess was V8 Super Car driver Scott Pye and the South Australian Tourism Minister Leon Bignell, both going for a spin in the 600 horsepower V8 truck, as Gordon launched it five metres in the air and over 40 metres down the Clipsal Pit Straight. The growth of the Stadium Super Trucks Series has been incredible and for us to take our Series outside North America for the first time is a really big deal so we were very selective with which event we chose. The Clipsal 500 is one of the biggest and best entertainment events in Australia so for us it was a perfect fit,” explained Robby Gordon. 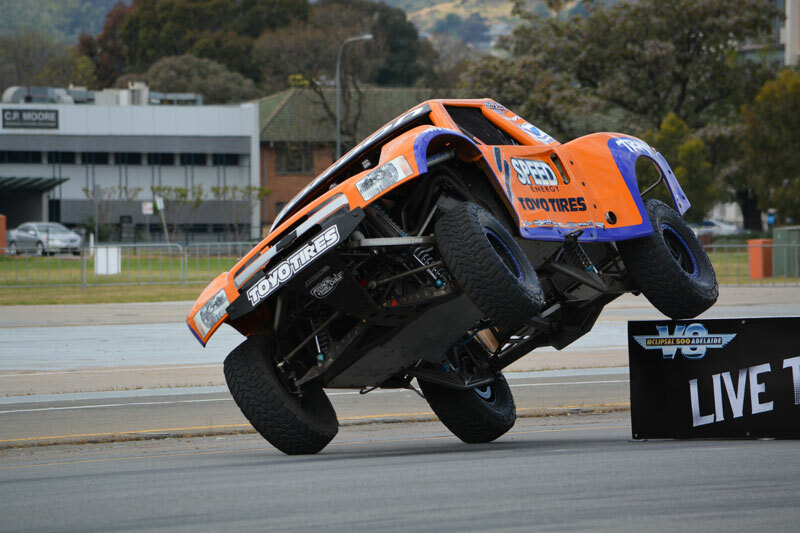 “We expect Robby Gordon’s Stadium Super Trucks to attract new audiences to South Australia from around Australia and even overseas with its cult following. 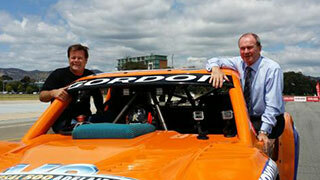 The Clipsal 500 will be the first event in Australia to feature Robby Gordon’s Stadium Super Truck Series which is a terrific endorsement for the event and the State of South Australia” added Leon Bignell, South Australian Tourism Minister. 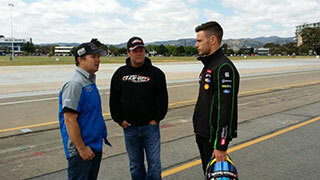 Clipsal 500 CEO Mark Warren said his team are always looking to introduce new categories to Australian motorsport fans. “We introduced utes to the motor racing scene back in 2001 which regularly rates as the second most popular category for Clipsal 500 fans in post event polling. 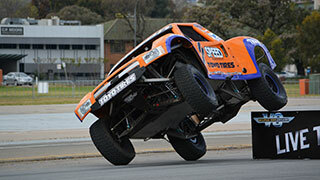 Stadium Super Trucks was a huge hit at the X-Games, and we expect that they’ll be one of the most exciting categories to race around Adelaide’s iconic street circuit in 2015,” Warren said. Gordon took the reins of Brad Gallard’s Toyo Tires backed Geiser Bros Trophy Truck, decked out in Robbie Gordon livery, for today’s announcement demonstration. 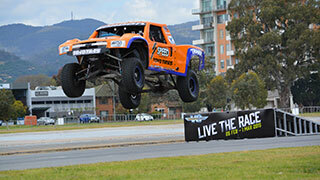 The purpose designed and built ramp, of which there will be numerous around the track come Clipsal, showed the speed and jumping capabilities that these purpose built trucks and achieve. 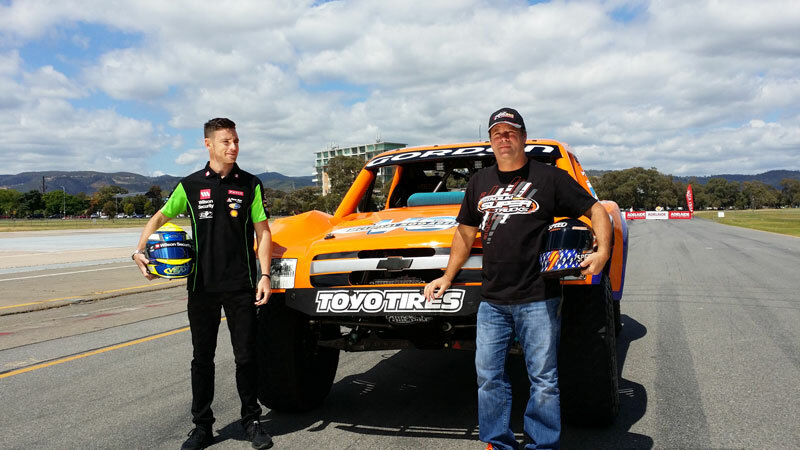 It is expected that 12 Super Stadium Trucks will debut on Australian soil when the 2015 Clipsal 500 kicks off on Thursday February 26. The proposed Clipsal race format, which is subject to confirmation, is two practice sessions on Thursday, one race on Friday, one race on Saturday between the two V8 Super Car races and the grand finale on Sunday as the precursor to the V8 Super Cars. 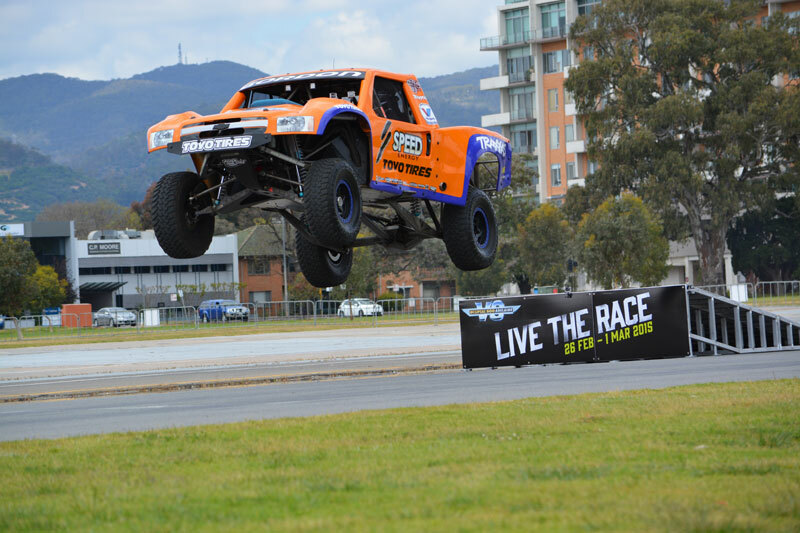 Competition on track is set to be fierce as the truck literally fly through Victoria Park, featuring drivers from a variety of disciplines and backgrounds. Gordon, the first Americans to win a stage at the Dakar Rally and a NASCAR veteran of 396 spring series races is the headline driver in the series, which has also seen Indycar driver Arie Luyendyn Jnr, motor cross rider Jeff Ward, Olympic snowboarder Nick Baumgartner and NASCAR driver Justin Lofton compete. The identically prepared high-horsepower trucks are made to resemble their scaled-down Traxxas radio-control-car counterparts. First developed in 2013 from a previous series in the 1990’s, in 2014 Gordon took the 13 race series to some of North America’s biggest markets including Texas, Detroit, Toronto, San Diego, Las Vegas, Los Angeles and the X Games in Austin.